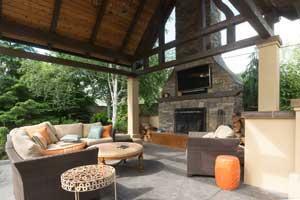 Searching for outdoor fireplaces in Scottsdale? Do you love the feel and look of a fireplace but don't want to be cooped inside? Do you wish you sit outside but not feel the chill of cool nights? At times like these, an indoor fireplace doesn't cut it. 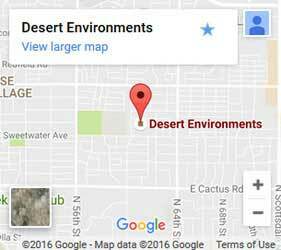 Fortunately, you can have the feel of fresh air combined with the great functionality of a fireplace with the help of Desert Environments. 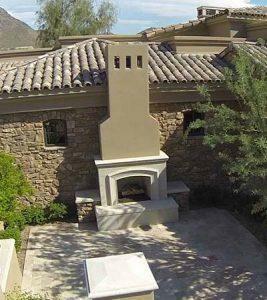 We'll work with you to create a custom outdoor fireplace in Scottsdale for your outdoor space. We will integrate the design of your fireplace and sitting area into the landscape to create a harmonious balance between nature and architecture. Have a particular style in mind? Also known as "Beehive fireplaces", this traditional style has the heat focused at the bottom. With the option of genuine river rocks or "clones", these provide a great natural look. Whatever kind of hearth you're looking for, we can make it work just how you want! If you prefer a fire pit to a fireplace, we'll find the best location for your yard. Want something to compliment your new outdoor fireplace? Our landscape design team can also build you an outdoor kitchen with a custom barbecue, add water features and pools, and more! With over 25 years of experience, we've been around long enough to know what we're doing. Focusing our efforts in the community we live and work in, we do our best to make it even better. Our landscapers have a keen eye and know how to make your house look great. Maybe adding some outdoor lighting will make your home pop. Or maybe adding a few rocks or some granite can make a huge difference. We work along with you to create that custom look you're searching for. So don't wait! Give us a call or contact us today!